SWU’s main campus is located in the center of Tokyo, 20 minutes from Shinjuku and 5 minutes from Shibuya by train. Our extensive graduate programs consist of 2 schools and 11 programs. 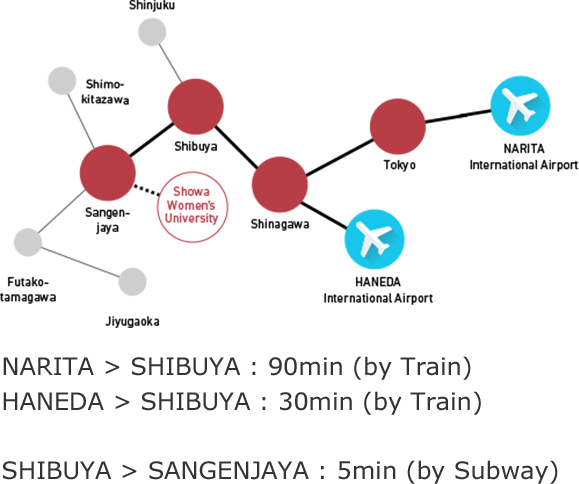 Undergraduate programs have 5 faculties with 13 departments. Showa is also a comprehensive educational institution that encompasses kindergarten, elementary school, junior and senior high school, all located on the same campus. We also share campus space with the British School in Tokyo. Showa Boston, established in 1988 in Boston, U.S.A., is our overseas campus. Situated in the quiet suburbs of the city, Showa Boston boasts a 24-hour security system which ensures students a safe educational environment in which to commit themselves to their study. Intensive language programs, a wide range of academic courses, and community-based projects challenge students to grow both intellectually and personally.